An intrepid group of 27 young people and families developed their faith and trust in others (!) 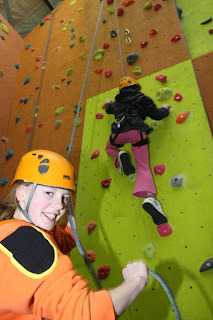 by going rock climbing at the Dart Rock Climbing Centre. The session included learning how to belay, traverse and 'boulder'. Climbers were between 6 years old and 40+ (?!) and even Rev. Selina was very pleased with herself for getting to the top! "Who encouraged me the most today?" "What was the best part of the day?" "What was the hardest part of the day?" It was an exhilarating day and helped us get to know each other too.